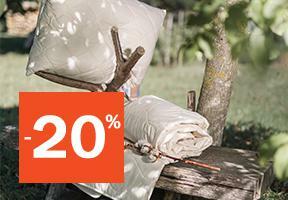 We're celebrating Easter season with 20 % discount on all our products. Take advantage today! Click on individual catalogue to view the electronic version! Delivery costs is being charged the actual cost of shipping. You will be informed about the costs before the final order confirmation before sending catalogues and catalogues to the selected destination abroad. Easter holidays are just around the corner, so we decided to celebrate with 20 % discount on all our products - quilts, pillows and bedlinen, kids collection and accessories.